Page after page is filled with knowledgeable insider tips, the hows and whys of shopping smart: Always beware of prices in carpeted areas of a store. Three-quarter sleeves are always flattering. Sometimes, for certain items like T-shirts or knits, it makes sense to shop in the boys’ department. For shoes, the best toe shape will always match your best neckline. Never shop in a hurry. When approaching a rack of clothing, always start with colour. Always sit down when trying on clothing. There are style basics, like how to find the perfect pair of jeans. Money-saving tips, like why never to open a store credit card. Shopping rules, like leave your jewellery at home when shopping. Plus tips for shopping online, in thrift stores, and around the holidays. And throughout, separate lists, like the 15 secrets of finding clothes that make you look ten pounds thinner; the seven things a tailor can do—and six things a tailor can’t; and the top ten wardrobe staples. A book worth its weight in gold—or what one charges on a gold card. 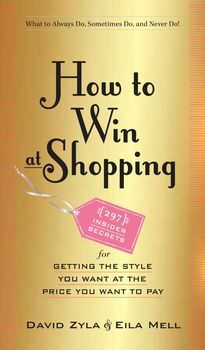 Written by two fashion experts with deep experience in fashion shopping and styling, How to Win at Shopping is perfect for the woman who loves to shop—there is priceless information on every page. And perfect for the woman who hates to shop—here’s the game plan to make it work. And for both, hundreds of ways to save money, time, and aggravation.